New and existing Onedox customers can securely connect their Starling Bank app to Onedox to make it even easier to take control of household finances. Available savings - helping you identify when you could be saving money by switching tariff or service provider. Your to-do list - letting you know when there are items to take care of in your Onedox account. 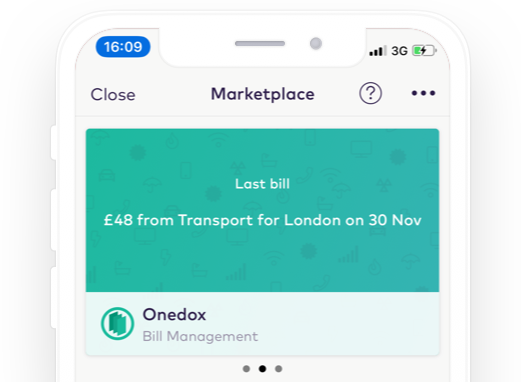 Secure your Onedox account using "Login with Starling"
Soon using Login with Starling will also make it even easier to get started with Onedox as we can identify your existing providers from your Direct Debit mandates. See related Starling bank transactions in Onedox alongside associated PDF bills and your provider account information. Identify who your service providers are from Direct Debit mandates and recent transactions to make it even easier to take control in Onedox. Existing Onedox customers will be able to link their Starling bank app to Onedox to take advantage of these features too. The Future: The sky's the limit! Identify when your contracts are likely to end by what Direct Debits you have setup in your Starling Bank account and recent transactions. Easily compare and switch providers and services from right inside your bank account: to a new gas and electricity provider, mortgage provider or a faster broadband deal. Get a new account setup in Onedox for each Direct Debit provider, enabling you to keep track of contracts, payments and subscriptions before even connecting your provider's online account for automatic data collection. ...and so much more...see our Open Banking + Open Utilities demo for a peek into what could be possible. What else would you like to see? !